Calcium is one of those things we don't usually talk about in terms of garden nutrients, right? I mean, you buy a bag of soil amendments and the big numbers are NPK, but what about the little guys? The minerals and micro nutrients that feed soil health? I'm no soil scientist, I don't purport to be an expert, but I can recognize a deformed fruit when I see one. (Blossom end rot, anyone?) Funk lookin' fruits can be a sign of calcium deficiency. Calcium is vital for sugar production in plants, it's part of what keeps your vegetables from being bitter. To boost my beds with a bit of calcium I fill empty milk and dairy containers with water to rinse them, but instead of pouring the water down the drain I'll pour it on a garden bed. I'm also hoping the finished bokashi will add micro nutrients to the soil, and the addition of bokashi-composted bones from dinner should add a little something to the soil, too. The texture ranges from a fine dust to gritty bits that look like pulverized shells on the beach. 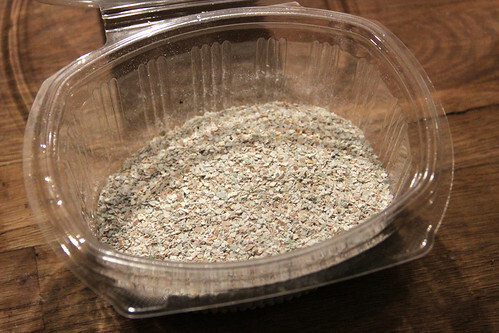 Since eggshells are a good way to keep slugs under control, the grit should work double time. The powder will be more readily available to the plants and the larger grit will work as pest control. It's not revolutionary, but I get a little excited about free garden solutions. 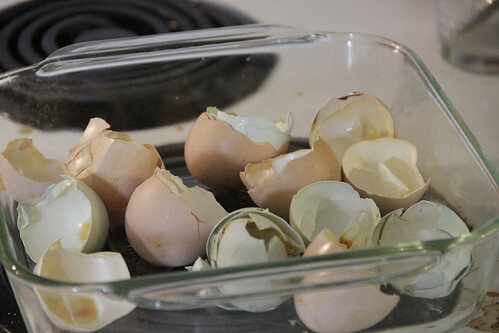 Do you save your eggshells? What's your favorite free soil amendment?